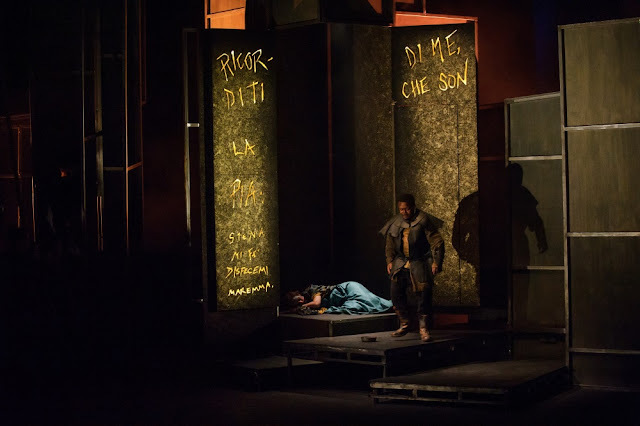 Donizetti's opera Pia de'Tolomei dates from 1837, the year after L'assedio di Calais (performed by ETO in 2015, see my review) and two years after Lucia di Lammermoor. Pia de'Tolomei comes from the end of Donizetti's long Italian career, he left his base in Naples in 1838 and would write only a handful more operas for Italy. 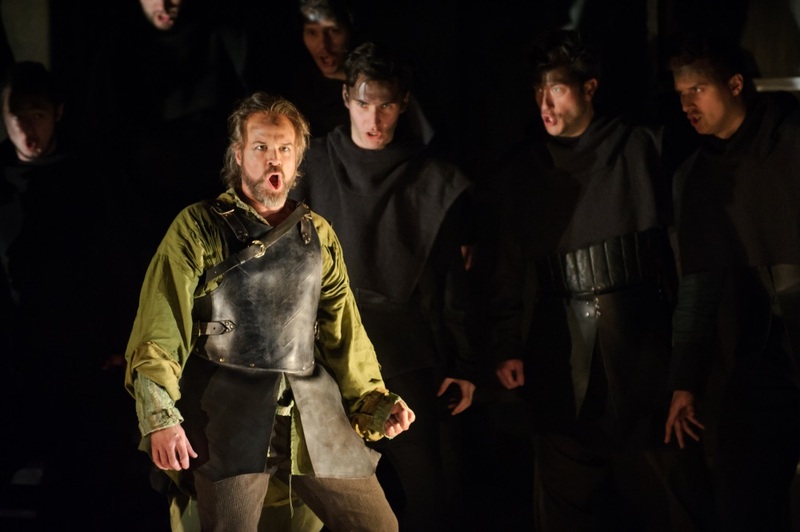 Previously only performed in the UK in concert, English Touring Opera's new production showed that the opera is a vital and dramatic force on the stage. English Touring Opera's production of Donizetti's Pia de'Tolomei opened on Thursday March 10 2016 at the Hackney Empire. James Conway directed, with John Andrews conducting, designs were by Loren Elstein and lighting by Guy Hoare. The cast included Luciano Botelho as Ghino, John-Colyn Gyeantey as Ubaldo, Grant Doyle as Nello, Elena Xanthoudakis as Pia, and Catherine Carby as Rodrigo. Like many of Donizetti's later Italian operas, the plot concerns a heroine in extremis, unfairly traduced. 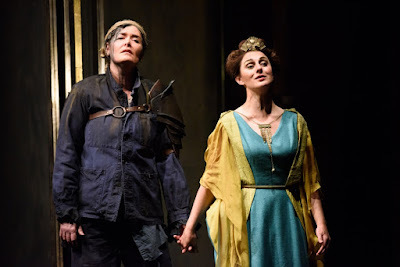 Though set in the 13th century during the wars between the Guelphs and Ghibellines, Salvadore Cammarano's libretto eschews grand historical sweep for intimate scenes. 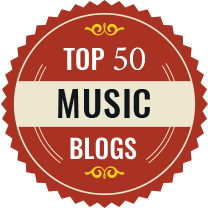 Donizetti responded with powerfully concentrated music. 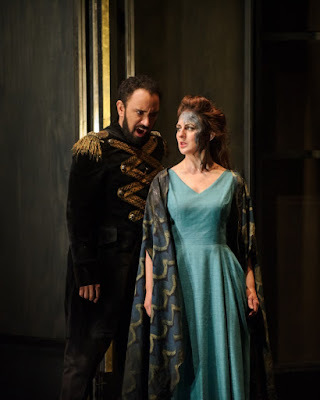 The opera is relatively unusual in that the tenor role, Ghino (Luciano Botelho) is the villain, in love with Pia (Elena Xanthoudakis) the wife of his brother Nello (Grant Doyle). Complications arise because Nello and Pia's brother Rodrigo (Catherine Carby) are on opposing sides so Pia's scheming to free the captured Rodrigo and see him lead to the assumption of her infidelity with this unknown man, leading to the inevitably tragic consequences. Surprisingly, Pia doesn't go mad but instead gets a powerful death scene where she exacts a promise of peace between the two factions. 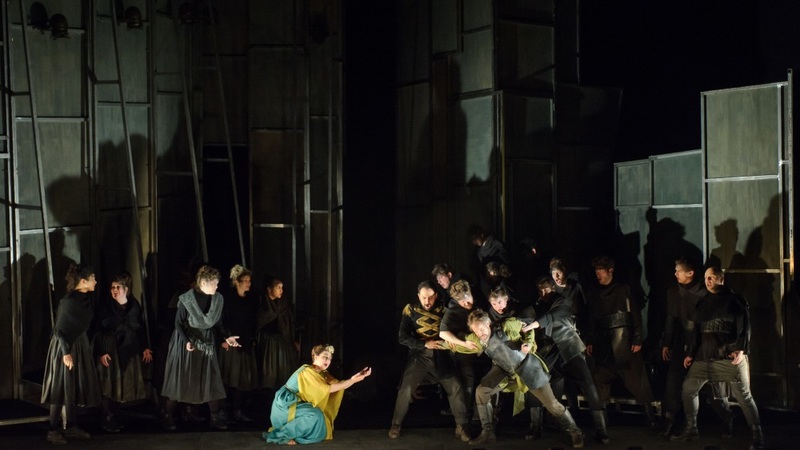 The operas nine scenes (some relatively short) require half a dozen different settings so James Conway and his designer Loren Elstein opted for a single set which was grim looking and relatively functional (appropriate given the wartime setting). But it provided a remarkably flexible series of playing spaces, along with a coup de theatre when Pia's tower (where she is incarcerated) opened up to reveal the phrase from Dante's Purgatorio which inspired the opera in the first place. Costumes were generically historical, with a mixture of pseudo-medieval and 19th century. Colour made a big point, with general dark and grey palate being offset by the green of the Ghibellines and the blue of the Guelphs. ETO had put together a strong and remarkably balanced cast who provided a strongly idiomatic and technically confident account of the score. The Greek-Australian soprano Elena Xanthoudakis made a strong and intensely moving Pia. Her repertoire is firmly in bel canto, with a number of Donizetti heroines and Verdi's La traviata to her credit. She has a voice with an interesting strength to it, bringing out the spinto hints in Donizetti's writing, but with a lovely flexibility too. It is not so much a luxurious voice as a finely honed one with a superb feel for Donizetti's line. Whatever she sang, she made highly personal and very expressive and her way with Donizetti's fioriture was very stylish. It has to be admitted that she was not entirely relaxed at the very top of her range, but no doubt will be more so after the first night. The role encompasses both fireworks and pathos, and culminates in the powerful death scene. Here Xanthoudakis held our attention and really made us suspend disbelief, thus creating a superb climax to the opera. The role of Ghino requires a tenor of some flexibility and confidence in the high tessitura; the original Ghino also sang Rodrigo in Rossini's La donna del lago and a number of Donizetti's lighter roles. Tenor Luciano Botelho was able to do just that, treating us to a series of acuti in 'voix mixte' which were perfectly in style for the piece. He has quite a light voice, and the role perhaps pushed him to the limit in the more dramatic moments but he remained stylish throughout. Clearly he was having a ball being the villain of the piece, but also his big scene with Xanthoudakis's Pia in Act two (when she persuades him to change his mind and explain to his brother that Pia's 'infidelity' was with her brother) was a powerful and unhackneyed moment. Third member of the tragic trio is Pia's husband Nello, played by Grant Doyle. The great virtue of the libretto is that he is not made into a cardboard villain, and though he jumps to conclusions in Act One and locks his wife up, in Act Two he is clearly tormented; jealous of her infidelity yet still loving her. Grant Doyle gave a really barnstorming performance, singing the role with a fantastically full, robust yet flexible line. In the Act Two finale he really act the scenery (perhaps almost too much so), but in Act Two we really came to appreciate the conflict in the character, in a beautifully rounded performance. Pia's brother Rodrigo was intended to be a small role, but the management of Teatro La Fenice in Venice engaged a distinguished mezzo-soprano so Donizetti had to expand the role. In later performances he reduced it again, but with Catherine Carby as Rodrigo ETO wisely opted for a fuller version. So Carby was able to sing Rodrigo's marvellous aria in Act One, a moving moment in prison which moves from despair to hope. Carby makes a fine hero and here she combined it with a lovely fluid sense, yet still sung with great warmth. And Carby, Xanthoudakis and Doyle made the final trio a memorable culmination of the opera. John-Colyn Gyeantey was wonderfully characterful as Ubaldo, Ghino's servant. This is a role important enough to get solo moments, and Gyeantey took full advantage of the opportunities to show us his confidence in the style and he sings the role of Ghino at two performances later in the run. Craig Smith was dark and sober as Tolomei's retainer, Lamberto making his relatively small contribution count. Piotr Lempa got one terrific scene as a hermit, here stripped to the waist and scourging himself. Susanna Fairburn demonstrated a striking presence, along with firmness of voice and purpose as Pia's servant Bice. 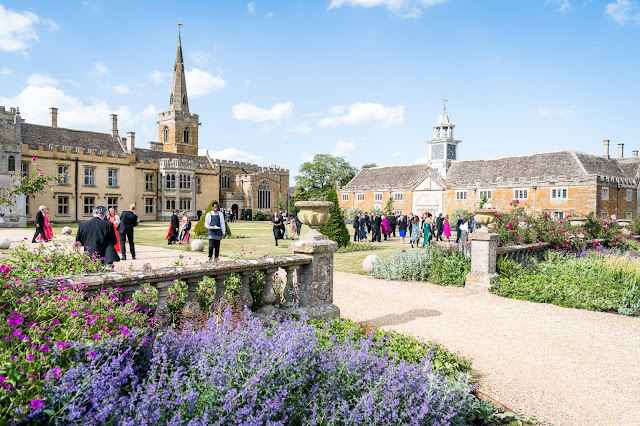 The chorus of 18 functions very much as a repertory company during the tour, with the young singers taking small roles in the production as well as providing covers for some principal roles. We got some stirring stuff from them during the performance. Donizetti includes terrific choruses both for the Guelphs and the Ghibellines and the singers responded with strongly vibrant singing. Under John Andrews the orchestra provided just the right combination of character and support. This was a swift, intense and rather dark account of the score but the swiftness did not preclude flexibility or a suppleness of line. This is providing to be a strong season for ETO with their intense, stylish and moving account of Gluck's Iphigenie being complemented by this stirring and highly creditable account of Donizetti's opera, sung by a quartet of principals with a lovely sense of Donizettian style. Update: my thanks to a correspondent (see comments) for pointing out that the story of Pia de'Tolomei actually occurs in Dante's Purgatorio. 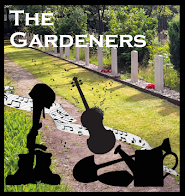 Fine review, although I’ve been surprised by the space Robert Hugill, and other critics, have given to the plot which, with its irredeemably outdated male-supremacism, has nothing to say to we who live in C21. Never mind, he identifies the excellent singers in this singers’ vehicle of a show, even if he fails to notice the conducting of John Andrews with its fascinating precision, von Karajan-like yet mixed with flexibility. Grateful though I am that Mr Hugill has given us such a well-informed assessment of this production of Donizetti’s rarely played Pia de’ Tolomei, I’m not sure he was as enchanted by the performance of Elena Xanthoudakis as I and my companion were. Perhaps we were lucky to see her on a night, 10 March 2016, when she was on top form. She was outstanding, a coloratura soprano who conquered a role encumbered with a frighteningly large range of notes while having to act in scenes of increasingly risible melodrama. Luciano Botelho, Grant Doyle and John-Colyn Gyeantey gave us huge pleasure (in, incidentally, a rather unresponsive house) and we want to hear them again, and again. But Xanthoudakis; well, I have a feeling I have seen in my home town of Hackney a talent that will take her to theatres beyond my budget. What a privilege. March 10th was the first night, so you must have seen it on the same date. 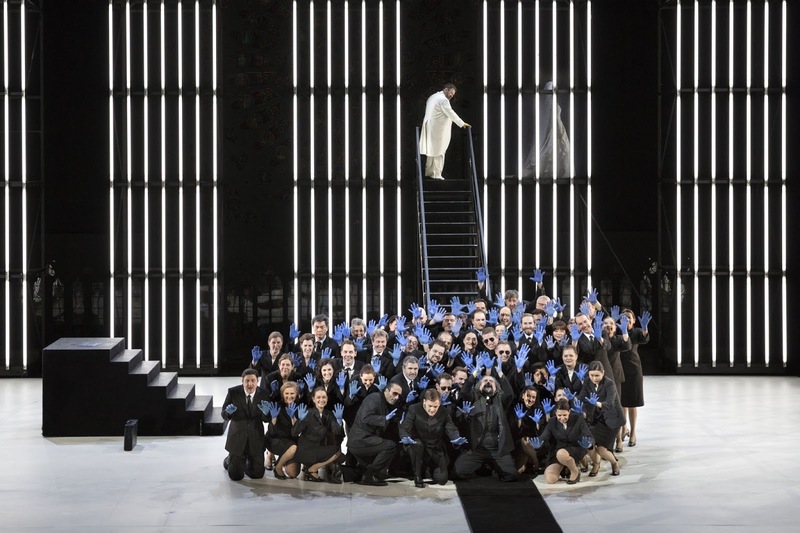 I also thought Xanthoudakis was excellent, and overall the opera gained much from being in the hands (or should I say in the mouths) of a set of singers who seemed to have a real sympathy with the bel canto tradition and what needs to be done vocally in order to make it work. As someone who finds early nineteenth-century Italian opera one of the least congenial aspects of the medium, I was, nevertheless, impressed. The plot is of course ideologically uncongenial, but sometimes one just has to accept that the past had different values and accept them provisionally for the duration of the work in order to engage with it. One correction to the original review: Dante's Pia is in the Purgatorio, not the Inferno. Thanks, will correct the Dante reference. Whether the plot is ideologically uncongenial really depends whether the piece is written from Pia's point of view or not. To a certain extent the plot has its sympathies with her, and though it explains Nello's behaviour it does not entirely condone it. The production went some way, but I would be interested to see the work directed by a woman director such as Olivia Fuchs.